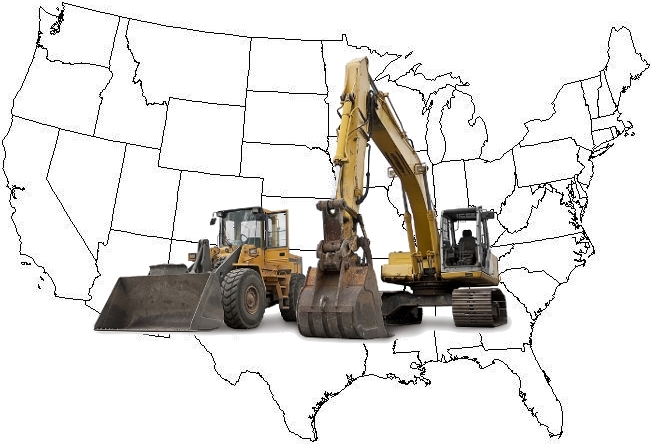 Heavy Equipment Appraisal is based in the United States and we offer nationwide equipment appraisal services. We provide appraisals to clients all over the map, from the biggest cities to the smallest farming communities (and everywhere in between). We often get questions from potential customers as to why they should choose a nationwide appraisal service instead of a local appraiser. After all, don’t the locals know the market better? Our repeat answer to that is yes, local appraisers most definitely know the local market better. The issue with that, however, is that we’re not selling or appraising Real Estate, where the 3 main valuation factors are location, Location, and LOCATION! Location does not matter (for the most part, in most applications) for an equipment appraisal. Unlike Real Estate, it is common to sell, then ship a piece of equipment to a buyer on another continent. The global market for heavy equipment is alive and well. This means that a heavy equipment appraiser, unlike a Real Estate appraiser, needs to know the hyperlocal, national, and international markets. As mentioned in the section above, there is a strong global market for heavy equipment. In fact, the global construction equipment market alone is estimated to reach $192.3 Billion by the year 2017. We at Heavy Equipment Appraisal know this because we attend heavy equipment auctions all across the globe. When not attending auctions in-person, we attend online auctions, where we can see that bids are coming in from all over the world. But the work doesn’t stop there. Once equipment auctions are complete, we capture the results, study them, and add them to our ever expanding equipment values database. In addition to auctions, we know what machines are selling for in the private sector. Due to the nature of the business, it can be very challenging to come by this information and many heavy equipment appraisers simply have to make their best guess. It’s not challenging for us because we maintain a strategic alliance with Equipment Trucks, Inc. (ETI), an independent heavy equipment dealer who deals both domestically and internationally. Ron Ruby, CEO at ETI, and his team have nearly 30 years in the heavy equipment business. Over that time, ETI has built a strong network of clients and fellow equipment dealers. Our partnership with ETI and access to the network they’ve built gives us the inside track to what’s going on in the private sectors in the national and international heavy equipment scenes. The price at which the property would change hands between a willing buyer and a willing seller, neither being under any compulsion to buy or sell and both having reasonable knowledge of relevant facts. Notice that there is no mention of location included in the definition. Simply, the agreed upon price between a willing buyer and seller. The willing seller might live in Des Moines, Iowa, while the willing buyer is in Dubai, United Arab Emirates. Wouldn’t you be more comfortable hiring a heavy equipment appraiser who knows what an excavator is selling for all over the world, rather than one who “thinks he knows a guy who knows a guy two town over who bought a similar machine a few years back”? Our only goal at Heavy Equipment Appraisal is to provide the the most accurate appraisals in the business. It’s not possible to achieve that goal without knowing the global market. We go to great lengths (and distances) to stay up with and understand the global market. So the next time you, or someone you know is in the market for a heavy equipment appraisal, be sure to ask your potential appraisers about their knowledge of the global heavy equipment market…better yet, give your clients and yourself peace of mind, skip talking to other appraisers, and talk to us about our nationwide appraisal services today! Nationwide heavy equipment appraisal services.